Supports the development of Maine communities. Cultivates the next generation of leaders and community problem-solvers. Deepens higher education’s commitment to civic and public purposes. Advance leadership throughout the state in addressing critical issues and strengthening democracy. Maine Campus Compact’s MPES Program will host 38 AmeriCorps Members (a combo of FT/QT/MT ) who will partner with higher education institutions and community organizations at 6 sites across the state. MPES Focus Areas are Environmental Stewardship and Economic Opportunity. Maine’s cold climate, inadequate weatherization resources, and aged building stock contribute to a vital need for increased energy efficiency. Economically disadvantaged populations, in particular, have a greater mean energy burden due to lower quality housing and reliance on energy-intensive heating devices. Through campus/community partnerships focused on energy efficiency education and light weatherization services, MPES AmeriCorps Members will increase energy efficiency and cost savings for economically disadvantaged populations, community organizations, and non-profit higher educational institutions. In addition to responding to the need for increased energy efficiency, MPES will address the need for more job opportunities and vocational training, particularly for unemployed and economically disadvantaged individuals in growth fields like green jobs. By participating in environmental stewardship training programs and receiving tailored career guidance, MPES AmeriCorps Members will gain a broad skill set for assessing energy efficiency, recruiting volunteers, and designing effective interventions. 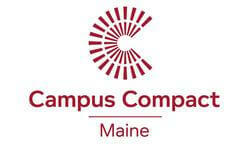 Maine Campus Compact (MCC) is a statewide coalition of colleges and universities whose purpose is to further the public purposes and civic mission of higher education. MCC’s team of 10 VISTAs will develop programming that mobilizes college students to increase college aspirations in Maine’s K-12 youth with an emphasis on low-income students. Maine Campus Compact’s Maine Partnerships for Environmental Stewardship (MPES) Program will host 38 AmeriCorps Members (a combo of Full-Time (FT), Quarter-Time (QT), and Minimum-Time (MT) members) who will partner with higher education institutions and community organizations at 6 sites across the state. MPES focus areas are environmental stewardship and economic opportunity. Maine’s cold climate, inadequate weatherization resources, and aged building stock contribute to a vital need for increased energy efficiency. Economically disadvantaged populations, in particular, have a greater mean energy burden due to lower quality housing and reliance on energy-intensive heating devices. Through campus/community partnerships focused on energy efficiency education and light weatherization services, MPES AmeriCorps Members will increase energy efficiency and cost savings for economically disadvantaged populations, community organizations, and non-profit higher educational institutions. In addition to responding to the need for increased energy efficiency, MPES will address the need for more job opportunities and vocational training, particularly for unemployed and economically disadvantaged individuals in growth fields like green jobs.